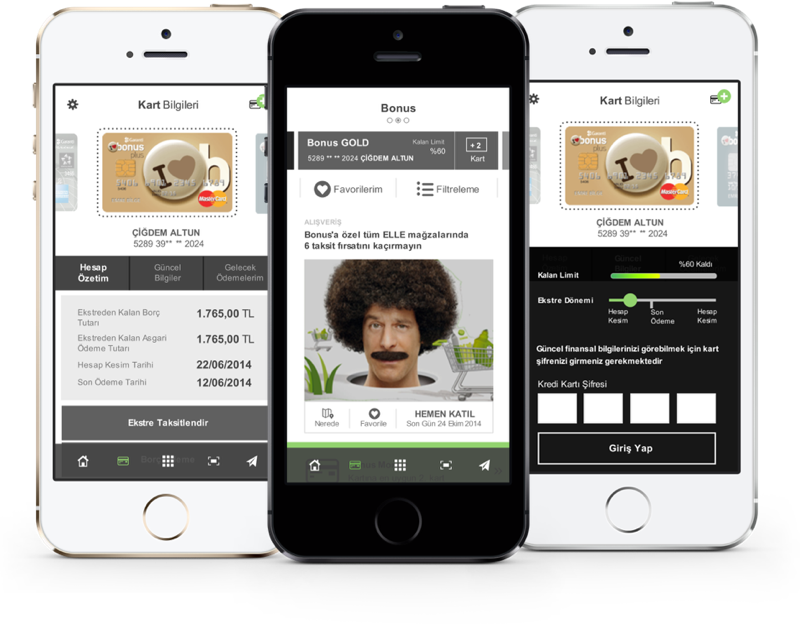 Credit Card Information and Campaigns in one application! "Bonus Flash" was the most challanging work of our team which ended up with a great success of 500,000+ downloads. The application was published at the end of 2015 and designs were made for two different operating systems; Android & IOS. My repsonsibilites in this project are defining the experience strategy, designing all wireframes, prototypes and flows in mobile application and communicating all deliverables to the client as a leader of a UX team. Our aim was met customer needs and business goals with optimal solutions. Some features are prioritised at the launch period and and other were postponed for beyond. Researched findings have shown that major expectations of users are; effortless tracking of campaigns, ensuring information security and having in control of the data. Users want to access the information of the products before and after their credit card transactions and edit those transactions immediately. Users also want to see the available limits before shopping. Users who are diligince about their financial decisions just want to track the campaigns. 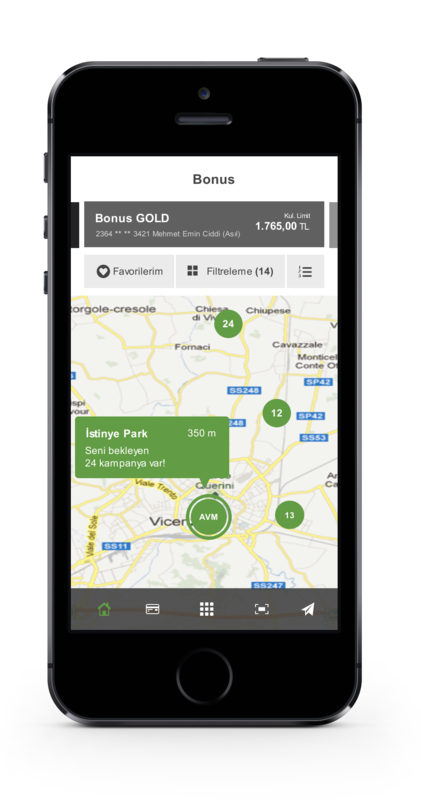 Campaigns tracked by the users can differ based on users location or time to use. Selection of a campaign mainly triggered by personal needs of the users. Feeling safe for users mean to track and control their financial transactions and campaigns whenever they needed. In order to feel safe users prefer to check their available limits and transfers and get information about generated revenues, after they use their credit card during shopping or made a transaction in online banking system. More than 30 applications were viewed and analyzed to understand the trends and to clarify the advantages and disadvantages. These applications were grouped according to the forefront features offered to customers. Strategy is focused on two basic needs of the users; which are track and control of financial transactions and campaigns whenever they needed. 2 different concepts were studied at the beginning of the project. Those concepts were tested with end users and the most suitable ideas were used in the final product. Screens were prepared as a mockup with more color to get a better insight from user testing. You can also find some additional features below. Swipe fature is added to ensure quick transition between pages for the users which have more than one credit card. Quick access to favorites and campaign filtering functions were also added. 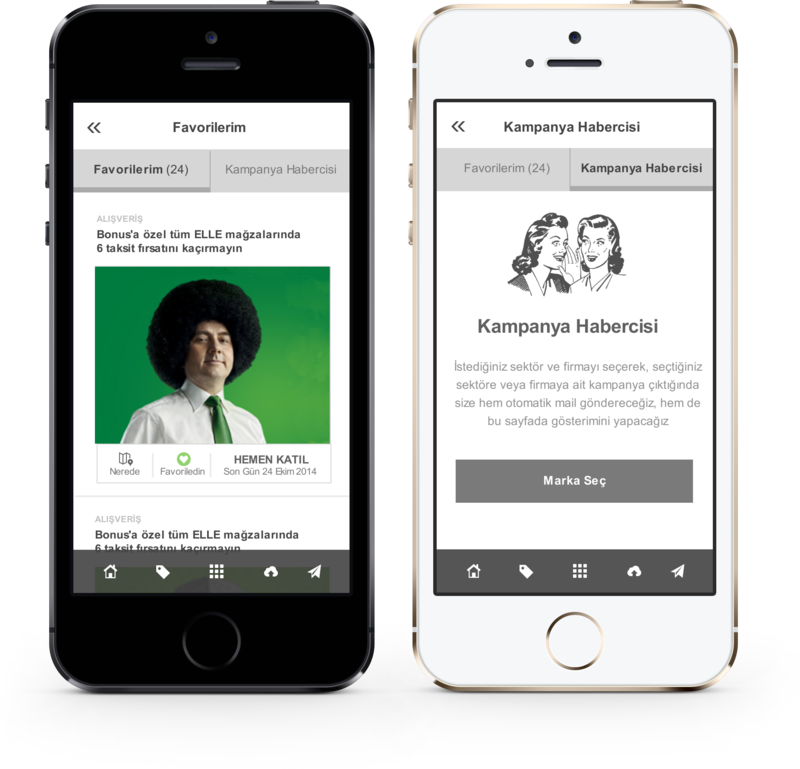 In every 2 campaign offer, a different guidance was made to direct users other pages in application and to prevent monotonousness of the campaign list. 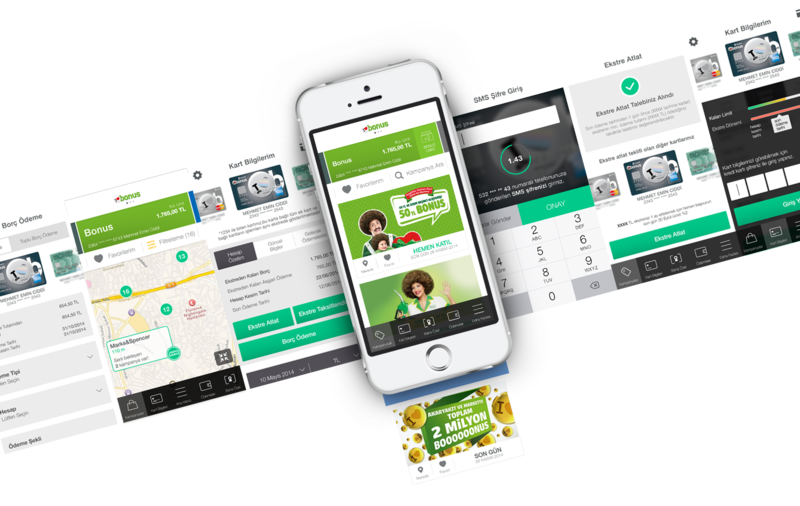 It has been observed that, users want to see different campaign options linked with location and time the application is used. Personal recommendation and campaign maps are also used to direct users to their preferred campaigns. Swipe fature is added to the card information page to ensure quick transition between pages for the users which have more than one credit card. 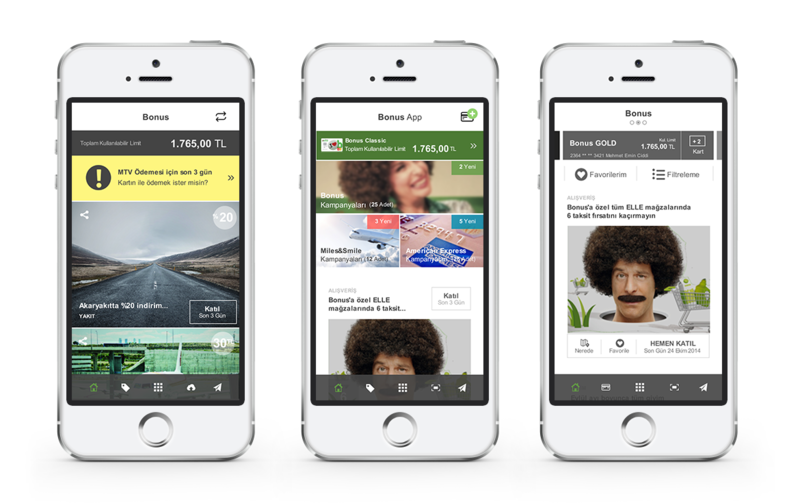 It has been observed that, users want to see different campaign options linked with the location and the moment when they use the application. Personal recommendation and campaign maps are also used to direct users to their preferred campaigns.In addition, campaign tracking tools were studied for the users who want to get update about the campaigns participated and the current status. Most tracked companies were collected in one place with my favorite area option. "Campaign Heralds" section is designed to track campaigns of the selected companies or sectors by users. Color, icons and typography structure was created ​based on Bonus corporate identity. Also different designs are prepared and presented to the client. Bonus Card family transitions is used to minimize the complexity for the users which have more than one credit card.